The HP8R is the perfect long lasting, high powered flashlight for any work environment. Equipped with our Pure Beam Focusing Optic with Slide Focus, users can easily shift between a super wide flood beam or spot mode with transition halo at varying distances and brightness all controllable with one hand. The Beam Lock System also ensures that users keep the beam in place while they work without risk of losing the perfect lighting. With our Flex Charge Dual Power system, this light harnesses either lithium or alkaline power and using a micro USB, you can recharge the batteries either in or outside of the light. With Coasts commitment to quality, the HP8R Flashlight is impact resistant, weather resistant and its LED is virtually unbreakable. The HP8R Flashlight is backed by Coasts lifetime warranty against defects in materials and workmanship. Tested and rated to ANSI/FL1 standards. Tbook.com crawls the web to find the best prices and availability on Flashlights and related Tools and Hardware products like Coast HP8R Rechargeable Flashlight. For this page, related items include products we find that match the following keywords: "Flashlight" at our vendor partner Home Depot. 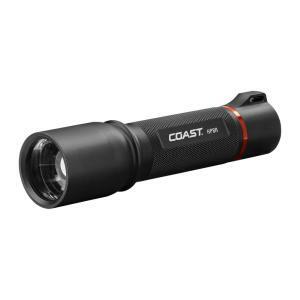 Coast HP8R Rechargeable Flashlight is one of 152 Flashlights and related products listed in the Tools and Hardware section of Tbook.com If you have any questions on this product, please give us a call at 734-971-1210 during the hours of 9am - 5pm EST for assistance. Thank you for shopping at Tbook.com, the Internet Department Store!